There are approximately three signature behavioral/cognitive syndromes that occur after damage to prefrontal cortex and its circuitary. First, damage to the dorsolateral prefrontal circuit causes executive dysfunction. These patients have difficulty in generating hypotheses and flexibility in maintaining and shifting sets as required by changing task demands. Second, damage to the orbitofrontal circuit causes disinhibited, irritable and labile behavior. This type of lesion also results in imitation and utilization behavior. Unlike patients with dorsolateral damage, these patients may not have executive impairments. Thirdly, damage to the medial frontal/anterior cingulate circuit causes akinesia, apathy and unconcern. Of course, patients may have damage to more than one of these frontal circuits, leading to a combination of clinical deficits. Unfortunately, these deficits may be hard to quantify on standard neuropsychological tests and may only be evident in real-life situations. This paucity of "objective" findings may lead to overlooking the possibility of damage to the frontal lobes in some patients. The frontal lobes may be less "hard-wired" than other cortical areas. They may act as an orchestrator for integrating other cortical areas and for calling up behavior programs that are appropriate for the context. Although this article is intended to outline a number of apparent frontal lobe functions, it is obvious that the functions of this massive and phylogenetically novel prefrontal cortex are complex, interrelated and as yet incompletely understood. 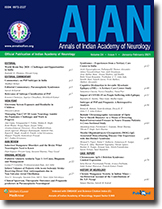 Thirty one patients with neuro-tuberculosis were subjected to pattern reversal visual evoked response (VER) studies. Eighteen patients had lone tubercular meningitis (TbM), while thirteen had additional complications (TbM+). VER abnormalities were recorded in thirteen patients (41.9%) as against abnormal clinical neuro-ophthalmologic assessment of 5 (16.1%). Compared to control values, mean VER latencies, inter-ocular. P 100 latency difference and amplitude of the reponses among patients were altered significantly, with no difference in the VER dispersion. The VER parameters of the patients with TbM and those with TbM+ were similar but for greater inter-ocular latency difference in the latter. The VER findings in patients with neurotuberculosis suggest asymmetric anterior visual pathways abnormalities predominantly of demyelinating in nature with asymmetry being more marked in patients with TbM+ with complications. Pyridoxine-dependent seizure is a rare autosornal recessive disorder that usually presents as neonatal intractable seizures. This syndrome is due to an inborn abnormality of the enzyme glutamic acid decarboxylase, which results in reduced pyridoxine-dependent synthesis of the inhibitory neurotransmitter gamma amino butyric acid. We report a girl child who had seizures on the second post natal day which was controlled with oral pyridoxine. She had status epilepticus twice when the drug was stopped at the age of 3 months and 21 months. The neurological development was normal. There was normalization of EEG abnormalities on intravenous administration of 100 mg pyridoxine. A brief review of the literature is also included. Cerebrotendinous Xanthomatosis(CTX) is an uncommon autosomal recessive disorder in which there is accumulation of cholestanol in tissues such as lens, tendons and nervous system. It is clinically characterized by progressive neurological and neuropsychiatric dysfunction with ataxia, spasticity, and peripheral neuropathy, associated with bilateral premature cataracts, tendon xanthomas, premature atherosclerosis and pulmonary dysfunction. Deficiency of the mitochondrial enzyme sterol 27-hydroxylase (CYP27 gene) is implicated in the pathogenesis. Two cases of CTX with similar history in the siblings, are being reported. One of them had tendon swelling, cataract, polyneuropathy, low IQ, ataxia, pyramidal tract involvement with electrophysiological abnormalities in the form of demyelinating neuropathy in nerve conduction tests and prolonged N19 latency in somato sensory evoked potential (SSEP) studies. The second patient had tendon swelling, low IQ, cataract, polyneuropathy, ataxia, involuntary movements, pyramidal signs with evidence of demyelinating neuropathy. She improved partially with Chenodeoxycholic acid (CDCA) and simvastatin. Histopathology of the tendon swelling in both the cases revealed disruption of the fibrocollagenous bands of the tendon by masses of xanthomatous cells containing foamy cytoplasm amassed around cholesterol clefts and multinucleated giant cells. Accurate and early diagnosis is important because of the therapeutic potential. We report 2 patients of POEMS syndrome. While M-protein was detected in one of them, it was not present in the other who had plasmacytoma in pelvic region.